With 41 track days, 668 participants, 800 visitors and several highlight events, Porsche Experience Centre (PEC) Sepang enjoyed its most successful year ever in 2018 as the main hub for the Porsche Experience in Southeast Asia. The year began with the Porsche World Road Show (PWRS), which was followed by the regional media launch of the third-generation Cayenne, as well as various track experience, including the Media Driving Academy that is geared towards improving the driving skills of journalists. The Cayman GT4 Clubsport MR and the 911 GT3 Cup Car training sessions also took place at Sepang to meet the demands of enthusiasts in the region, with the latter being held for the very first time in Southeast Asia. Later on in 2018, the inaugural E-Performance Nights event resulted in PEC Sepang making history by being the first Porsche Experience location operating for nearly 24 hours in a day, The event, which capitalised on the night lights of the Sepang International Circuit, also involved a collaboration with Samsung Electronics for the very first time, showcasing the latest, state-of-the-art Samsung audio and visual solutions. Of course, these events were backed by an impressive pool of Porsche vehicles for participants to experience, from the Cayenne Turbo to the Panamera Turbo S E-Hybrid, 718 Boxster GTS, 911 Carrera T, 911 GT3, up to the 918 Spyder. “I would like to say a big thank you to all of the participants – fans, customers, Porsche Club members and journalists alike – who have contributed to the most successful year ever for us,” said Marc Beil, marketing event manager at Porsche Asia Pacific. “I am looking forward to an even greater 2019 with more fantastic Porsche Experience events and a brand new fleet of high-performance Porsche vehicles. I would encourage anybody who has not joined us yet at PEC Sepang to get in touch, as our slots run out really quickly,” he added. Aside from creating enriching experiences, PEC Sepang also made time to fulfil the wish of Yogan in collaboration with Make-A-Wish Malaysia. The 11-year old, who was diagnosed with Ewing Sarcoma, had always dreamt of flying alongside Superman, but the superhero’s busy schedule meant a meeting would be delayed. Instead, Yogan was treated to a flying lap of the racetrack in a 911 Turbo S with 580 PS, a century sprint time of just 2.9 seconds, and Porsche works driver Earl Bamber behind the wheel, which is about as close as an experience to the young man’s dream. 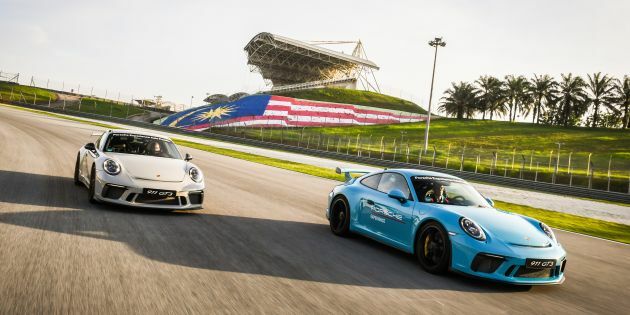 For 2019, PEC Sepang is ramping up its efforts to offer more events, including the Track Experience and the Porsche Motorsport GT Day which offer money-can’t-buy experiences with rare Porsche models like the 911 GT3 Cup and the 911 GT3 RS. The fleet will also be refreshed with the latest 911 that recently celebrated its world premiere at the Los Angeles Auto Show. With electrification being an important aspect of Porsche’s future, PEC Sepang will also assume the role as an E-Performance competence centre, with models such as the Panamera Turbo S E-Hybrid and the fully-electric Taycan – the latter will make its debut in the region in early 2020. If you’re interested in being part of the Porsche Experience, you can find more information about PEC Sepang, as well as a sign up, here. The racing still involves different model of porsche even from the same brand. Toyota should learn. That one specific catfish model racing is so hilarious.